In many forms of circle track racing a dual or redundant ignition system is used. If you use a dual system complete with two coils, the Automatic Coil Selector makes it possible to change coils, without having to pull into the pits and change the coil wire. 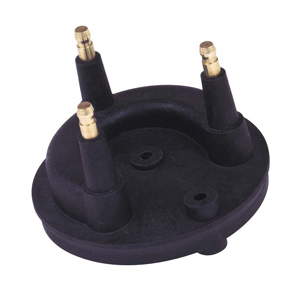 The Automatic Coil Selector features three posts; one for each coil and the other to go to the distributor cap. This way, when a driver switches ignitions, the Coil Selector automatically switches to the backup coil. To use the Coil Selector, two ignitions, two coils and a single-pole, double-throw switch are required.